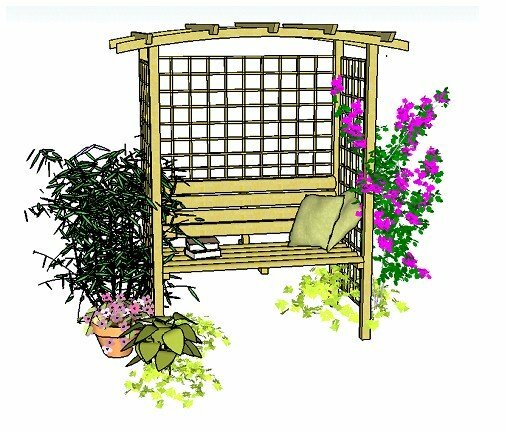 These seated arbour plans will help you create your own piece of heaven, away from the hustle and bustle of daily life! 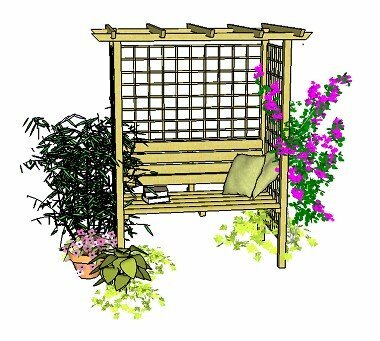 This blissful arbour will fit perfectly in any cottage garden, with only birds and bees for company, surrounded by myriads of colourful flowers or will sit just as well in a sleek, modern design with geometric forms and striking plants. The step-by-step plans for beginners come in two designs: one with a gentle curved rafter and the other with a straight rafter style. Both are included in the plans. They were developed as a bespoke arbour for someone who wanted a special place to sit to think about his loved ones. It was a wonderful story...and so the plans were born. There's something very special about sitting in a beautiful seated arbour: it is cosy, welcoming and very romantic. Think sunshine, relaxation and good company. Surrounded by gorgeous plants and interesting accessories, it's a place where we love to be on a balmy summer's day. Add planters, pots, stunning climbing plants, garden furniture, and colourful and interesting accessories, to make your arbour a really welcoming outdoor space. This arbour picture shows the design with straight beams and rafters. ...these seated arbour plans include an integral seat. The example footprint is 4ft 5" x 2ft 5", an ideal size for an arbour with seat. This is based on the width of the footprint being 4ft, with 2.5" planed posts, and the depth being 2ft with the 2.5" planed posts, but the plans will work whatever the size of your posts. This is fully explained in 'Adapting The Plans'. 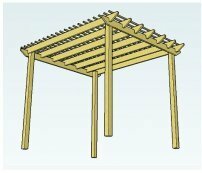 The arbour picture at the top of the page is drawn to scale, with a post size of 2.5", main rafters measuring 3" x 1.5", and cross rafters measuring 2" x 1", but again, the plans will show you how to use different sizes of timber to suit your own particular preference. Here is the footprint with the rafters attached. The rafter tails will be very straightforward to make as the arbour needs a simple design for the rafter tail ends. However, if you would like something slightly different, there are 4 free rafter tail template designs included with the plans. 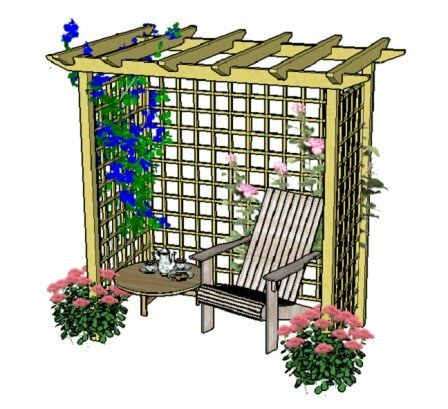 The seated arbour plans are designed for beginners. They show every step of the way how to build this beautiful arbour, with diagrams that are both clear and detailed. 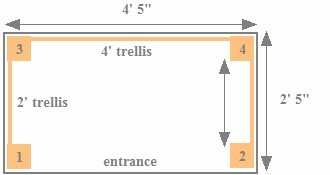 Can I Really Build This Pergola Myself? Even though the finished arbour looks stunning, it is actually quite straightforward to build once you know what size fixings to use and where to cut the notches. 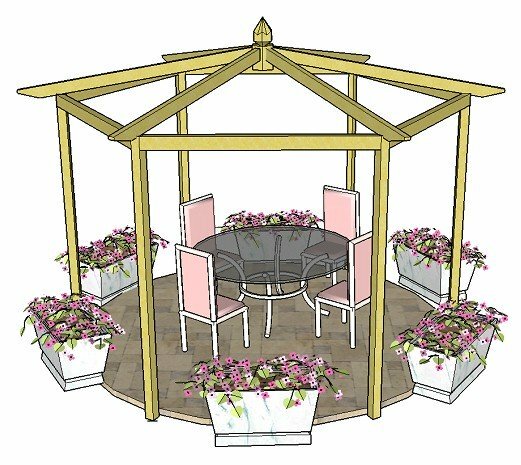 Follow the seated arbour plans carefully and you will have this romantic arbour installed in no time at all. So if you feel confident, have a go. It's a great feeling, making an arbour from scratch. And the end result is well worth it! 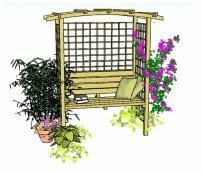 Because these plans were created as a bespoke arbour for a visitor to the website, they form part of the 'Additional Pergola Plan' series and so have a small charge. Of course, you can easily use the principles outlined in the free pergola plans to build any pergola or arbour. But if you would prefer to have a step-by-step guide to building this particular arbour with its integral seat, for the price of one of the rafters, you will have at hand detailed instructions on how to create an absolutely beautiful structure for your home and garden. Why will these attached pergola plans be great for you? They are intended and written for beginners! If this is the first time you have tried a project like this, or your experience is limited, then they will make everything so much easier. They give step-by-step, detailed instructions on exactly what to do. Within the plans are simple, clear diagrams at every stage. They include a section on adapting the plans, to fit your needs and particular situation..
All tools and materials have links to the items you need, so that you can take a look to see what they are like, either buying them from an internet store or using your local DIY store. Many people have contacted me to say how easy to use, detailed and comprehensive the plans are. There are 4 different, ready to use, rafter tail templates, to make your pergola into a beautiful and unique structure. The finished arbour looks fantastic! There are several ways to adapt the plans to fit your own style and construction preferences. The plans still work with any of the modifications. Making your arbour taller, if you are particularly tall, or if you would like to grow climbing plants over the rafters. 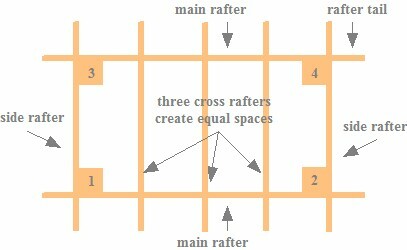 Using the straight or curved rafter style. Both are covered in the plans. Changing the rafter tail end design. Using different ways to fix your pergola to the ground. The plans are ready for immediate download, together with the 4 free rafter tail templates. You will need Adobe Reader installed on your computer in order to read the plans. If you don't already have this essential software, you can download it here. It is simple, quick and free to download. If you can't find the download email in you inbox, please check your junk/spam folder. Click on the 'Add To Cart' button below, follow the simple instructions and your seated arbour plans will be with you straight away. Feel free to email me using the contact form with any questions you may have. I hope you have a great time building your arbour. It will give a whole new dimension to your outdoor living. Here's to your fantastic new arbour. Be sure to send a picture when you're finished!